Senate Democrats and liberal groups are mounting a pressure campaign against the Supreme Court, hoping to influence future decisions by blasting conservative justices for alleged political bias. The essence of our Constitution is to limit and disperse the power of government. Now, Democrat Senators, Reid (D-NV), Whitehouse (D-RI) Schumer (D-NY), and Leahy (D-VT) as well as their political allies are intentionally violating the principle of the Separation of Powers. The framers of our Constitution limited the power of Congress, and it is the Supreme Courts duty to declare a law void when Congress exceeds the limits on their Constitutional powers. 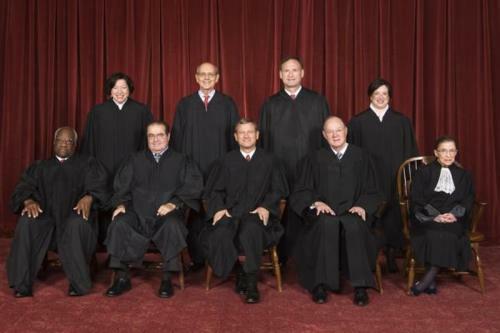 Here is a real example: Was Chief Justice Roberts influenced in the ObamaCare case? Did he switch his vote that the ObamaCare fine was a tax – a tax is a Constitutional power vested with Congress - because he thought the power and prestige of the Supreme Court would irreversibly damaged? There are many people who speculate and reason that is exactly what happened. Robert’s feared the Democrats would scream that the Court stole the election in 2000. Then, if the Roberts' Court declared ObamaCare void, the Democrats would scream again the Court was voiding a duly passed law – ObamaCare. Thus, Roberts created the tax to save the power and prestige of the Supreme Court. What were the mental machinations of Chief Justice Roberts? Most likely, Americans will never know. Except, it is certain Democrats believe Justice Roberts and the Court can be pressured. They accept they pressured Roberts and are spending time and money to pressure the Court again. Randy Barnett, a law professor at Georgetown University Law Center, compared the Senators pressure campaign to coaches working the referees in basketball games. Alexander Hamilton, one of the smartest of America’s Founders, wrote in Federalist No. 78, "The complete independence of the courts of justice is peculiarly essential in a limited Constitution." Today, approximately 230 years later, Democratic Senators are attempting to demonize our conservative justices. Worse, it appears that Chief Justice Roberts was influenced by previous pressure. In Federalist No. 78, Hamilton explained the necessity of the Supreme Court to declare a law void, "… whose duty it must be to declare all acts contrary to the manifest tenor of the Constitution void." Finally, Hamilton reasoned if the Court fails in its responsibility to declare a law unconstitutional there is no restraint on Congress. Without this, all the reservations of particular rights or privileges would amount to nothing. It is deplorable that our Senators and President have demonized members of the Supreme Court. It is unconscionable for members of the Court to succumb to campaigns of demonization. America critically needs political leaders imbued with the philosophy of freedom. Government that is small and limited. Achieved by dispersing and separating the enormous powers of government.